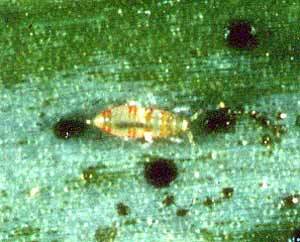 Natural enemies generally keep thrips populations below damaging levels. Conserve natural enemies by reducing or eliminating pesticide use. Locate garden plants away from weedy, grassy borders where thrips live. Keep plants well watered, and fertilize judiciously to prevent overly lush growth. Dormant oil is a useful control on fruit trees.